Where is Siri on my iPhone or iPad? The first thing you may notice is that there isn't an application icon for Siri. So now that you’ve set up Siri how do you start to use it on your device? After reading this, check out our quick start guide, which features a list of the most popular Siri commands for beginners. How do I turn on Siri on my iPhone or iPad? Press and hold down the “Home” button on your iPhone/iPad to open Siri. You will hear two quick beeps/vibrations to tell you that Siri has woken up and is waiting to do your bidding. In iOS8 and higher, you can enable hands-free mode. Open your iPhone or iPad's settings, select Siri & Search. Check that the switch for Listen for 'Hey Siri' is turned on. If it isn't, follow our guide on how to enable the feature. 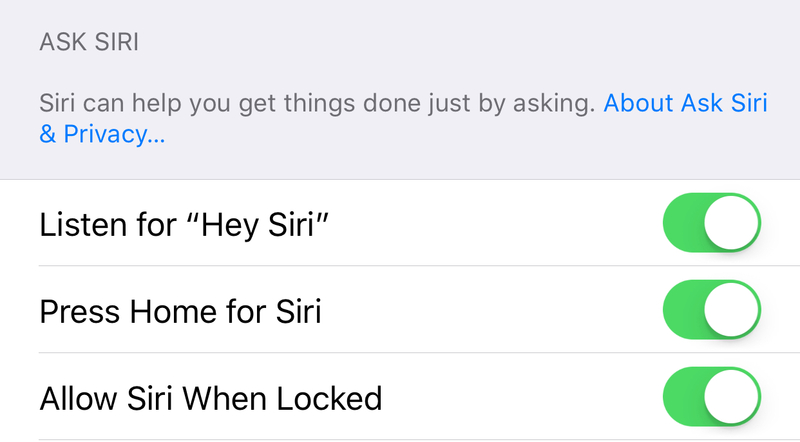 'Hey, Siri' works in any situation, even if the screen is locked or if an application is open and running. You can change this in your security settings. Once Siri is activated you can speak naturally, and do not need to pause after saying 'Hey, Siri'. Hey Siri, where is the nearest park? Note: For 'Hey Siri' to work, your device will need to be plugged in if it is an iPhone 6 or iPad 5th generation or lower. For a headset that uses a remote or another type of Bluetooth device, hold down the center button or call button until you hear a chime. Then talk to Siri. If you are using AirPods, you'll need to double-tap the outside of either one to talk to Siri. Hold down the voice-command button on your steering wheel, then tell Siri what you need. Siri waits for you to stop talking. If you have a touch screen with CarPlay, you can also use Siri by pressing and holding the Home key on the screen. You can tap the audio-wave button to tell Siri you're done talking. This is useful if Siri can't hear you because there is background noise. Opening certain apps like Phone or Messages can also connect you to Siri. Siri adapts its behavior depending on how you're connected. For example, if you're connected from a wired or Bluetooth headset, from Siri Eyes Free, or from CarPlay, Siri reads your messages so you can approve them before sending. For more advanced usage, such as dictating an email or longer text message, it’s worth checking our dictation guide.